Between last year's historic November supermoon and August's partial solar eclipse, a lunar event that's coming on Dec. 3 has taken a bit of a back seat. But 2017's first and only visible supermoon is nothing to sneeze at. 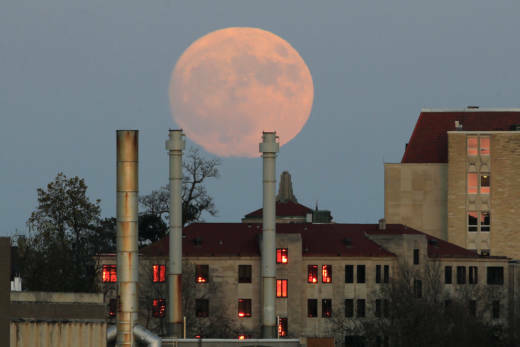 The term "supermoon" is popular vernacular. Its scientific name is perigee syzygy. University of Arizona professor Gurtina Besla says the phrase means two specific things in reference to the moon's placement and phase. "Perigee refers to the moon being at its closest distance to the Earth, and syzygy refers to the alignment of multiple bodies — the moon, Earth and sun need to be aligned for us to see a full moon," Besla told NPR. "So it translates to the closest separation between the moon and Earth when the Earth, moon and sun are aligned." Because the moon is closer to Earth, it can appear about 14 percent larger than an apogee moon, or micromoon, which is when the moon is at its farthest distance from our planet. NPR's Bill Chappell reported that last November's supermoon was the closest Earth's moon had been to the planet since 1948, and it's not scheduled to get that close again until 2034. Like any phase of Earth's moon, a supermoon is safe to view with the naked eye. Besla says she is not personally that excited about the upcoming supermoon because the difference in the moon's perceived size is negligible. She knows, however, that many will still try to see it at peak viewing time. According to Besla, the best time to see this year's showing is at 3:45 a.m. ET on Monday, Dec. 4. If that's a bit too early for a wake-up call, don't worry. The moon will still appear larger than normal when it's close to Earth's horizon at sunset on Dec. 3 and sunrise on Dec. 4.
" 'Don't make the mistake of photographing the moon by itself with no reference to anything,' he said. 'I've certainly done it myself, but everyone will get that shot. Instead, think of how to make the image creative—that means tying it into some land-based object. It can be a local landmark or anything to give your photo a sense of place.' "
He also recommends using the reactions on people's faces in photos. While it's difficult to get a quality shot with a smartphone, it's not impossible. "Tap the screen and hold your finger on the object (in this case, the moon) to lock the focus," Ingalls told NASA. "Then slide your finger up or down to darken or lighten the exposure." For those using digital cameras, he suggested the daylight setting to get the proper white balance. According to National Geographic, this is the fourth supermoon of 2017, but the only one visible to the casual observer. The previous three "coincided with new moons, when the lunar disk shows a totally darkened face."